Martin Scorsese's Hugo helped introduce many people to the wonder of automatons — i.e., mechanical people and other figures. But there's a lot more to automatons than Scorsese's film revealed, including some things you won't believe people managed to make move long, long before robots. Automatons were the predecessors of the early 20th century electronic robots, and here are some of the most wonderful ones. 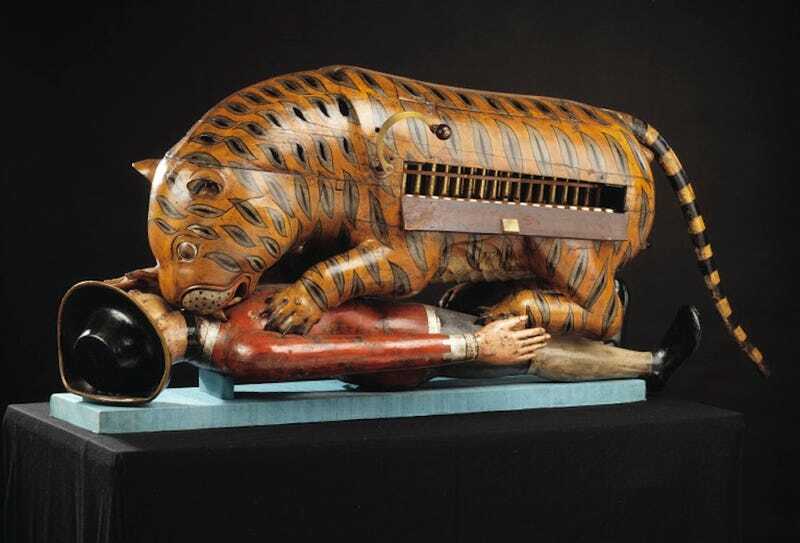 The strange, life-sized mechanical toy was created for Tipu Sultan, the ruler of the Indian Kingdom of Mysore in the 1790s. The soldier is a young Englishman named Munro. The mechanisms inside the tiger and the man's body make one hand of the man move, and emit a screaming sound from his mouth and little grunts from the tiger. The automaton was discovered in the Sultan's summer palace in 1799 and sent to Britain. Now it's one of the most interesting artifacts of the Victoria and Albert Museum. Here you can see a 26-minute documentary about Tippoo's Tiger. The 15-inch-tall clockwork Padre, the figure of the well-known miraculous monk San Diego de Alcalá, was made of wood and iron and manufactured by Juanelo Turriano, the mechanician of Emperor Charles V, in the 1560s. The monk can walk around, beating his chest, lifting his cross and praying silently. According to legend, the son of the King of Spain, Don Carlos, fell down a set of stairs and was seriously injured. The Emperor himself was praying near his slowly dying son's bed and promised a miracle for a miracle. Don Carlos began to heal and the king kept his bargain by having Turriano construct the small, penitent homunculus. The duck automaton was created by Jacques de Vaucanson in 1739. It had over 400 moving parts in each wing alone, could flap its wings, drink water, eat kernels of grain and was able to poop them. The food was collected in an inner container and pre-stored feces was sent out, of course, but Voltaire was really impressed, and wrote "without Vaucanson's Duck, you have nothing to remind you of the glory of France." It's a little bit weird, but less than these robots from the late 19th and the early 20th centuries. In the early 1840s it was repaired and could be seen at the Exposition Universelle at the Palais Royal in Paris in 1844. Later it disappeared and was spotted in the 1880s among the collection of a museum in Krakow. A fire destroyed the building and only the partially destroyed wings have survived. In 1998, a copy was displayed at the Museum of Automatons in Grenoble. This fake chess-playing machine was constructed by Wolfgang von Kempelen (Kempelen Farkas) in 1770 to impres the Empress Maria Theresia of Austria. The machine was able to play chess games with human opponents. It was secretly operated by talented chess masters, but it was believed to be an automaton for decades. The original machine was destroyed in a fire at an American museum in 1854. John Gaughan, an American manufacturer of magician equipment, built a new Turk with the original chessboard, which was stored separately and not destroyed in the fire. Three automatas were built by Pierre Jacquet-Droz, his son Henri-Louis and Jean-Fréderic Leschot between 1768 and 1774. The last and the most complex of them was the writer, which is able to write any text up to 40 letters. The text is coded on a wheel where characters are selected one by one. The robot boy uses a goose feather to write, which he inks from time to time. His eyes follow the text and the head moves when he uses the ink. The first of the three Jaquet-Droz automatons is a female organ player who could play the custom-built instrument quite well. 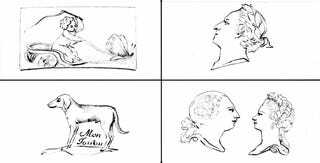 The draughtsman is another Jaquet-Droz automata that could draw four different images: a portrait of Louis XV; Marie Antoinette and Louis XVI as the royal family; a dog with Mon toutou ("my doggy") written beside it; and Cupid driving a butterfly chariot. The young child also moves on his chair, and occasionally blows on the pencil to remove dust. This automaton onstructed in 1784 by Peter Kintzing and David Roentgen, the cabinetmaker of Louis XVI, for Queen Marie Antoinette at Versailles. It is said that the hair is the Queen's hair and the dress was sewed from one of Marie Antoinette's dresses. The tunes played by the small player were written by the Queen's music teacher, the German Christoph Willibald Gluck. Constructed in 1810 by Friedrich Kaufmann in Dresden, Germany, the Trumpeter in Spanish costume had leather bellows for lungs and reeds which imitated the sound of a brass instrument. The Swiss watchmaker Henri Maillardet's creation was produced in partnership with watchmaker Jaquet Droz around 1820; only six are known to exist. It has 11 ring segments, framed by seed pearls, decorated with gold-set rubies, turquoise, emeralds and diamonds. Its underside is coated with champlevé black enamel. One caterpillar was sold three years ago at a Sotheby's auction in Geneva for $415,215. These small, mechanized puppets were used in Japanese homes from the 17th century to the 19th century. The most common zashiki karakuris were tea-serving automatas.